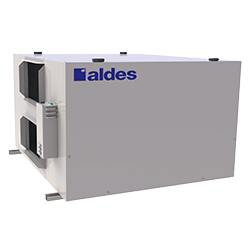 Aldes Light Commercial Heat Recovery Ventilators (HRV) provide high-efficiency heat recovery for indoor pool applications. The H1800-Fi-P uses a robust, water-washable polypropylene core that can withstand the air-quality challenges of a pool environment. The H1800-Fi-P powerfully removes excess humidity and keeps pool users comfortable. 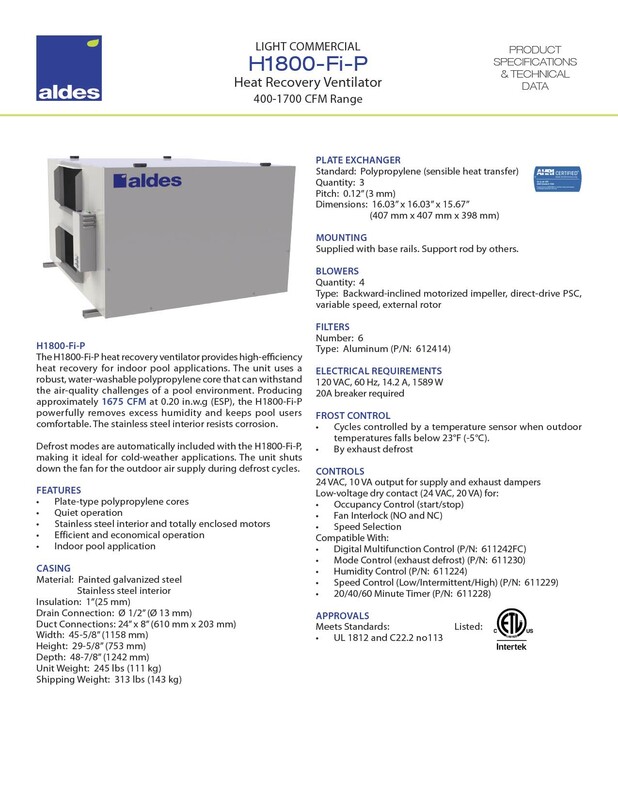 The stainless steel interior and epoxy-coated blowers resist corrosion. Fan exhaust defrost is automatically included with the H1800-Fi-P, making it ideal for cold-weather applications. The fan for the outdoor air supply shuts down during defrost cycles. Other key features include: non-dust-loading backward-inclined impellers, integral mounting rails, and advanced electronics.